You've got the fresh bread, the juicy fillings and the flavoursome spreads. The only thing missing is the meat… Or is it? These vegetarian sandwiches are so delicious meat lovers won't even notice that their poultry is still happily walking around the farm. From Sydney's best restaurants and cafes, we find vegetarian sandwiches that are so tasty carnivores, omnivores and herbivores will leave truly satisfied. Priding themselves on sandwiches that taste like mum's, this family must have grown up with one talented mother! But the guys at South Dowling Sandwiches are right, there is something undeniably familiar and inviting about their sandwiches. Maybe it's the comforting combination of flavours and fillings, or the colourful array of their ingredients spread out, banquet style. You can design your own sandwich here with flavours upon flavours of vegetarian options or opt for the Vegi which comes with hummus, potato salad and all sorts of delicious fresh and grilled veggies. Healthy AND delicious? We like that combination. Brainchild of Paul Gesho (Mecca Espresso), baker Simon Cancio (Luxe) and chef Ben Abiad (Love Tilly Devine and Sean's Panaroma), the boys at Brickfields know how to whip up a tasty veggie sanga! Just picture grilled enoki and field mushrooms, truffled mayo, gruyere cheese and pickled jalapenos all sandwiched inside their freshly baked sourdough. This bad boy is so delicious it's back by popular demand, all for the special price of $10. Recreating the New York diner scene with a modern twist, this little pocket in Bondi makes a very gourmet sandwich. Lox Stock and Barrel's roasted vegetable sandwich is overflowing with flavour and texture and is filled with tasty basquaise vegetables, paprika, smooth labne and a tangy tapenade served on rye. This sandwich will leave you satisfyingly full! For a hit of Vietnamese street food, Great Aunty Three is the place to get your banh mi on. Think pickled carrots, mayo, coriander, a touch of soy sauce and chilli, all wrapped up in a freshly baked baguette. Owner Michael Le knows how to make a pork roll without the pork that is so good you won't regret ordering the vegetarian option. Le has added his unique touch to the traditional banh mi with slices of green apple and a sprinkling of roasted pumpkin to tantalise your tastebuds. Take a walk down Bourke Street during the day and you'll be greeted with the irresistible smell of baking bread. With one of the lengthiest bread menus (and queue to match), these guys know their stuff when it comes to all things bread. The charming little cafe has a great vegetarian sandwich filled with all the kapow and oomph you might have hoped for in a meatier alternative. 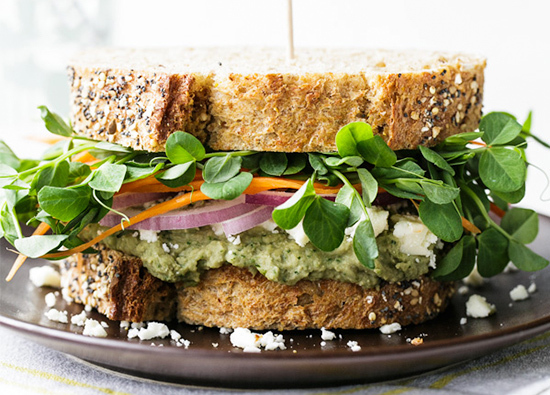 The roasted eggplant and hummus makes this sandwich a hunger buster, while the red capsicum jam, cottage cheese and feta add a luscious flavour like no other, plus you'll get a dose of iron in the baby spinach. Win! "Life is like a sandwich, you have to fill it with the best ingredients". This is the quirky but truthful ethos of The Sandwich Shop. For fast food that isn't really fast food, these guys offers fresh ingredients, zingy flavours and affordable prices to make your sandwich experience all it can be. We recommend you check out their Ultimate Salad Sandwich packed with avocado, hummus, cucumber, sliced tomato, beetroot, grated carrot, red onion and leaf lettuce. Three Williams are famous for their excellent brunches and their house made narnies. While not your traditional sandwich, we've included it our list because the ingredients are served within a folded piece flatbread (which is kind of like a sandwich) and just tastes so darn good! Go for the tempeh narnie - Inside you'll find Asian style pickled veggie, Sriracha and lime mayo. Deeeelicious! For a deliciously large sandwich, you'll want to check out Big Bite on Pitt. They might not be the fanciest of lunch spots but if it's a good vegetarian sandwich you are looking for to silence those stomach grumbles, you're in the right place! Be sure to order their roasted vegetable sandwich that's served with basil oil, lemon, chive mayonnaise, tasty cheese, Roma tomatoes, lettuce and rocket served on either Vienna bread or a wrap for a lighter option. Inspired by the streets of NYC, Brooklyn Hide brings you authentic bagels, boiled then baked. This joint has two vegetarian bagels that we highly recommend. First try out 'The Broadway' well endowed with spiced tomato, egg, rocket and avocado. If this doesn't tickle your fancy, then head down the menu to 'The Greenwich' which is filled with flavoursome spiced tomato, avocado, cabbage slaw, pickled carrot and basil. Named after the acclaimed sandwich inventor himself (John Montagu), this café takes their sandwiches seriously. Their ethos is to do away with the pre-wrapped sandwich and instead make everything fresh to order from their supply of locally sourced produce. We recommend the 'Mushroom'- field mushrooms, truffled parmesan, garlic crème fraiche and rocket served up on a tasty multigrain.